The Seven Remix XP application was designed to improve the Graphical interface of your Windows XP. A great part of the resources of your system files are replaced. 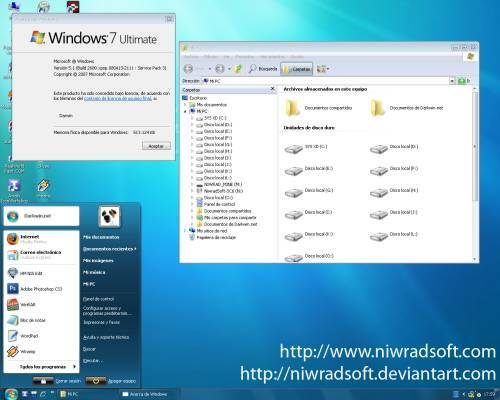 Files that contain icons, images, animations that are extracts of Windows 7 having obtained therefore a Win7 of their improved Windows XP. The installer automates the process of substitution of system files. It makes a backup of its archives in case that it needs to recover them. ...... It applies adjustments in the registry, it installs programs of third, skins and visual extras like sounds, styles, etc. In addition, it makes a backup of its archives in case that it needs to recover them. Qweas is providing links to Seven Remix XP 2.2 as a courtesy, and makes no representations regarding Seven Remix XP or any other applications or any information related thereto. Any questions, complaints or claims regarding this application Seven Remix XP 2.2 must be directed to the appropriate software vendor. You may click the publisher link of Seven Remix XP on the top of this page to get more details about the vendor.